Not me, and hopefully my umbrellas are sturdy enough so this will never be. This is the second time in 2 weeks that we had a black rainstorm alert. I've never lived in a tropical place before, so this warning system is new to me. We were told to stay indoors and be careful of flooding, although they should also have warned us of falling objects, since on the way home I spotted quite a few tree branches strewn across the sidewalk. Yikes. "People who are already at work should stay where they are unless it is dangerous to do so." HK also has typhoon signals, although thankfully there's only been one typhoon warning (for No. 3), and it never actually came about despite it being almost August and well into typhoon season. When I say No. 3, it sounds like there must be quite a large scale, right? Actually, there are just two primary typhoon signals: No. 3 and No. 8. (Who knows what happened to all the levels in between...) No. 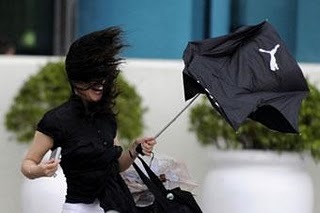 3 means persistent wind conditions at speeds between 41 and 62 km/h, while No. 8 means speeds of 63 to 117 km/h. It's only with No. 8 typhoons that we're permitted to stay at home from work.